So, every activity, project, program is focused on achieving its scope, within a certain schedule while consuming given resources. 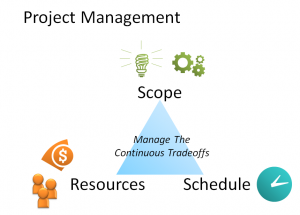 Project management must be the way to achieve that singular solution. Full stop. It can be, and it is, this simple. How much time do I/we spend proofing this report due next month? How many people do we need to build the booth for the church picnic by Wednesday? And because these are one-off efforts- discrete efforts or work products- we never give it a second thought. The people who do it well keep getting more work to do, and those who “don’t get it” (be it scope, schedule and/or resources) do not succeed. 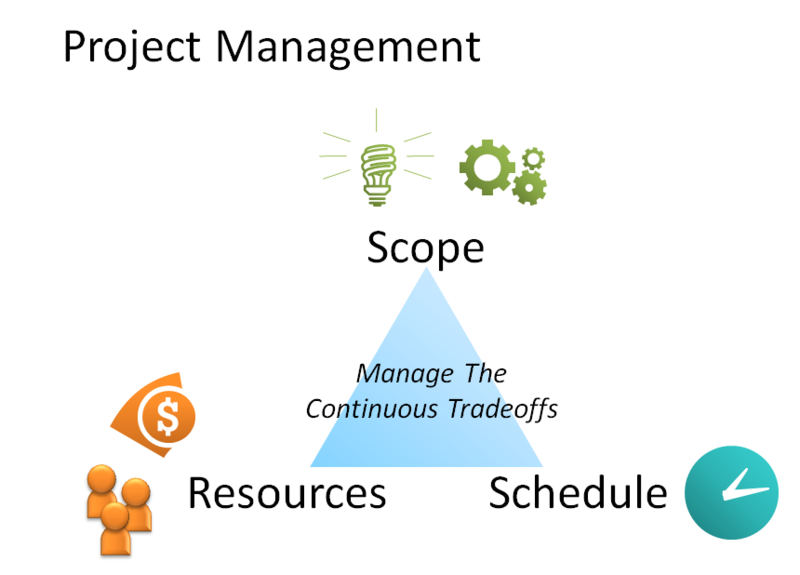 It is only when we raise the stakes, do we roll-out this need for “project management”, which is why it is perfect for all these discrete, one-time efforts. You only have to invest in as much project management structure as you need to manage the risk of not achieving your scope, within the the schedule, based on allocated (or most probably, available to you) resources. Getting a letter mailed this afternoon does not carry the risks of say building a house, nor the risks of launching a new product world-wide. However, they are all projects. And, they all have three things in common. They all have: a Scope, a Schedule and some limit on Resources. When we do encounter higher risk, more complex projects, we can break them down into individual streams of work or we can create separate ”work packages” of scope, schedule and resources. Because each project is discrete, we typically do not spend an inordinate amount of time defining, for example, the scope. Carrying this example, this leaves us some wiggle room on the quality of the deliverable to the customer of the project (as long as we satisfy our ”customer’s” needs). Or, if we do spend some time understanding what is required (e.g., scope), how often does it come with a “by Friday” (e.g., schedule) and “only spend two hours on it” (e.g., resources). Hence, we generally have the ability to trade-off between amount of a person’s time, and/or the schedule. It is this continuous trade-off based on developing, potentially unknowable-at-the-start, information we define as project management. Ask what, when and how much? Discuss potential risks and trade-offs you might anticipate. Great post, Tom. You’ve boiled down project management to its core elements of focus for success.